Finally, I had a chance to put together some of my past Paper Pumpkin kits! 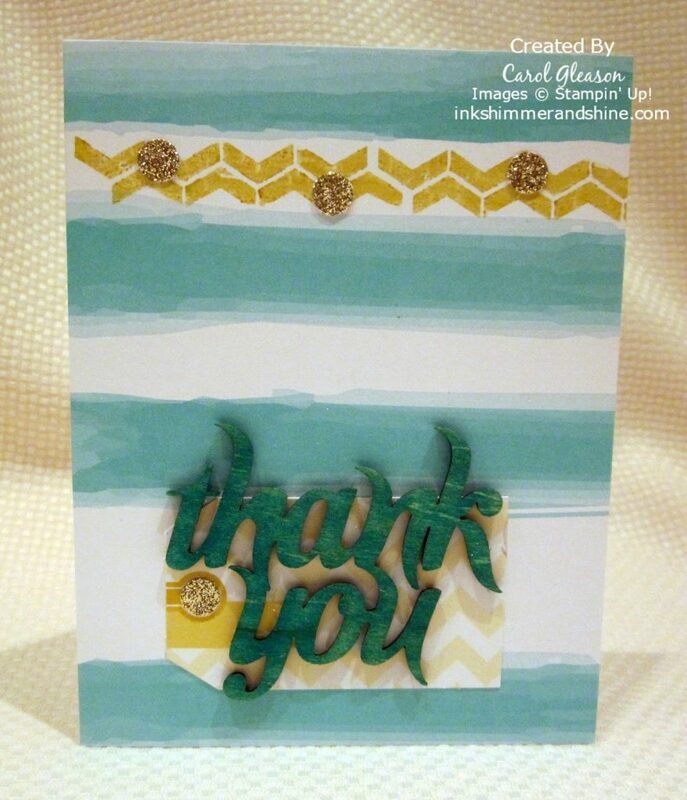 Today I’m sharing a couple of cards using the March 2014 Glittered Greetings kit. On some I used the wooden elements, and on others, the striped cardstock and the gold glitter dots. 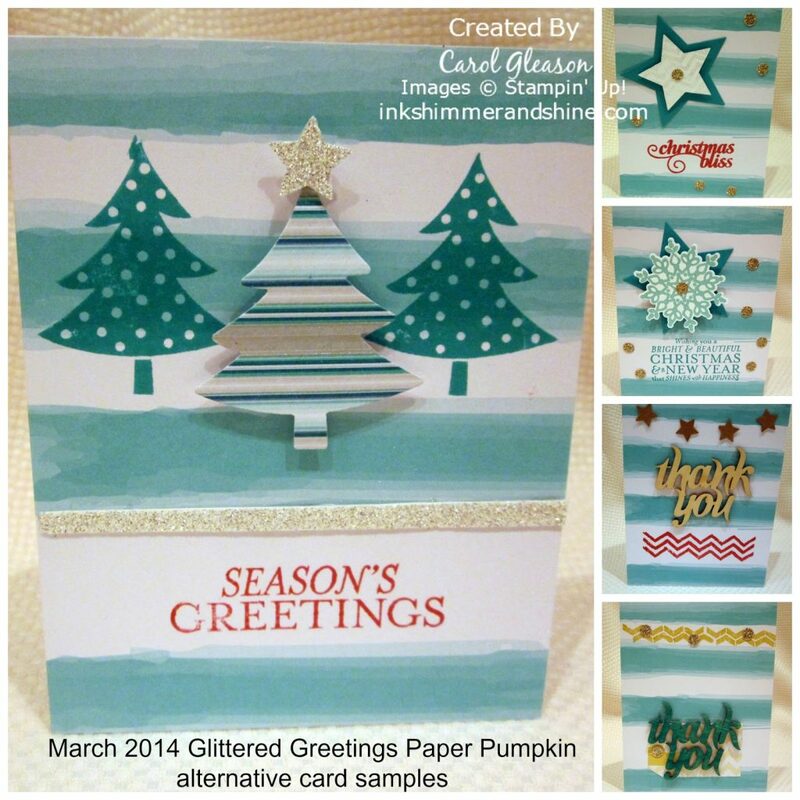 The Season’s Greetings card uses a star and strip of silver glimmer paper, a greeting from the Bright & Beautiful stamp set stamped in Melon Mambo ink, the tree from Scentsational Season stamped in Bermuda Bay and another tree cut with the Holiday Collection Framelits from Winter Frost Designer Series paper and popped up with a Stampin’ Dimensional. 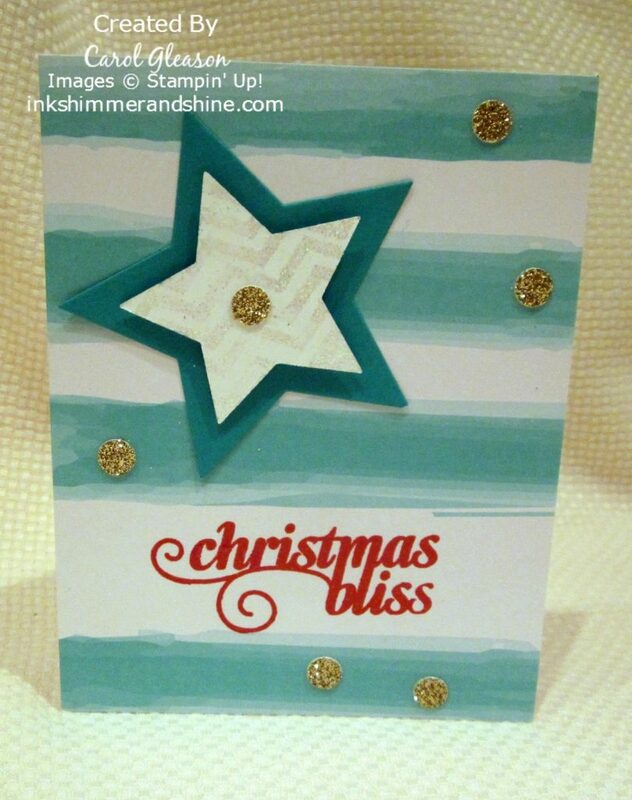 The Christmas Bliss sentiment is from the Christmas Bliss photopolymer set (love it!) and is also stamped in Melon Mambo. The gold glimmer dots are from the Paper Pumpkin kit. The stars were cut with the star Framelits (large one is Bermuda Bay, small one is whisper white stamped with Versamark using a stamp from the Work of Art stamp set, then heat embossed with Irridescent Ice embossing powder). 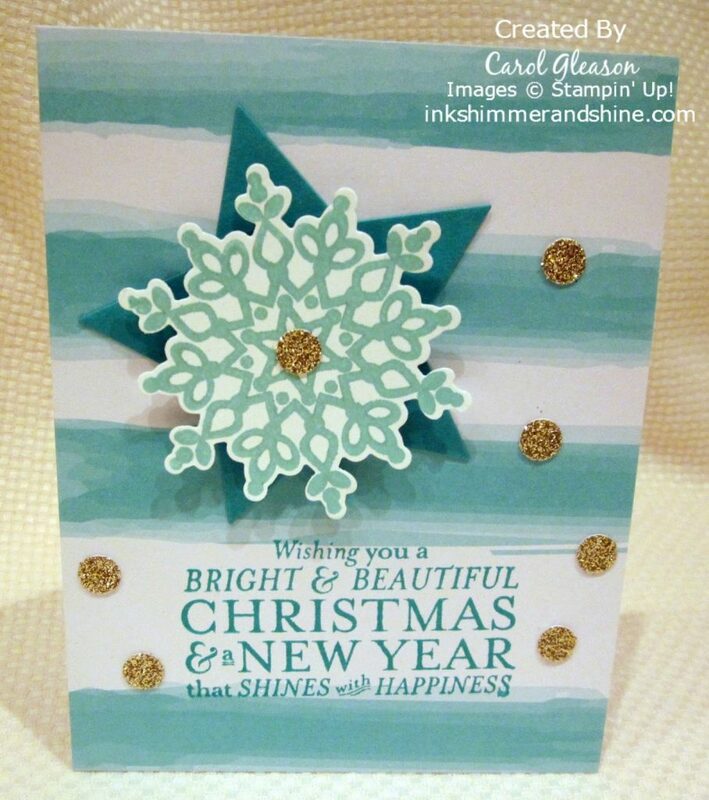 The third Christmas card also used a star framelit, a snowflake stamped in Coastal Cabana ink and popped up with a Stampin’ Dimensional, gold glimmer dots and a sentiment from the Bright & Beautiful stamp set, stamped in Bermuda Bay ink. 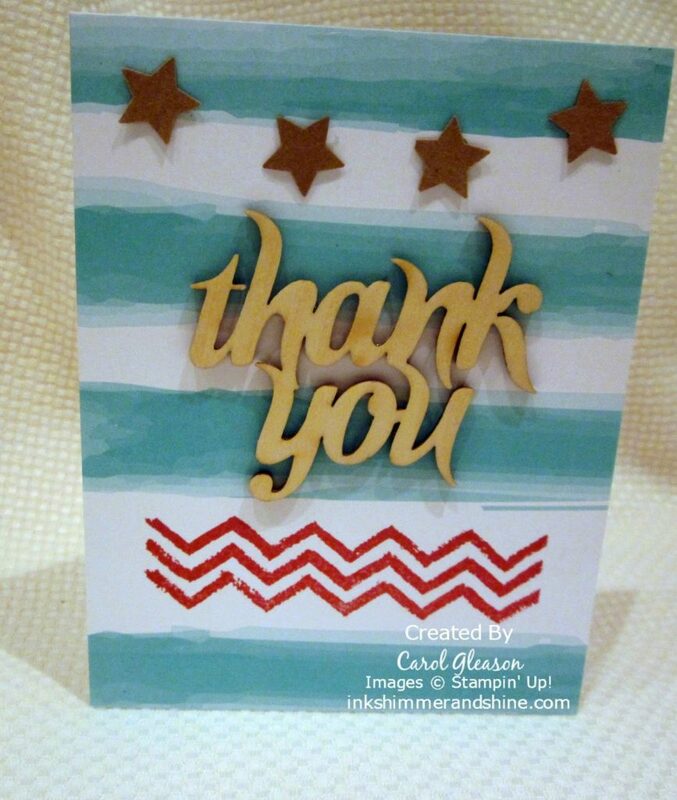 For my last two cards, I used the thank you wooden elements from the Paper Pumpkin kits. On one I added some little kraft stars left over from another project, then stamped a design from Work of Art in Melon Mambo – Simple! On the other I used a Summer Starfruit tag left over from the Everyday Occasions cardmaking kit, and the gold glimmer dots and stamp from the Paper Pumpkin kit, inked in Summer Starfruit. To add a different look to the wooden element, I daubed on Bermuda Bay ink with a sponge dauber. So I hope you’re not as far behind on your Paper Pumpkin kits as I am. go ahead and make them into thank you or holiday-themed cards. Use your imagination – I’d love to see what you have created! Bright & Beautiful, Christmas Bliss, Work of Art. Bookmark.